This hotel is 100pct non-smoking. 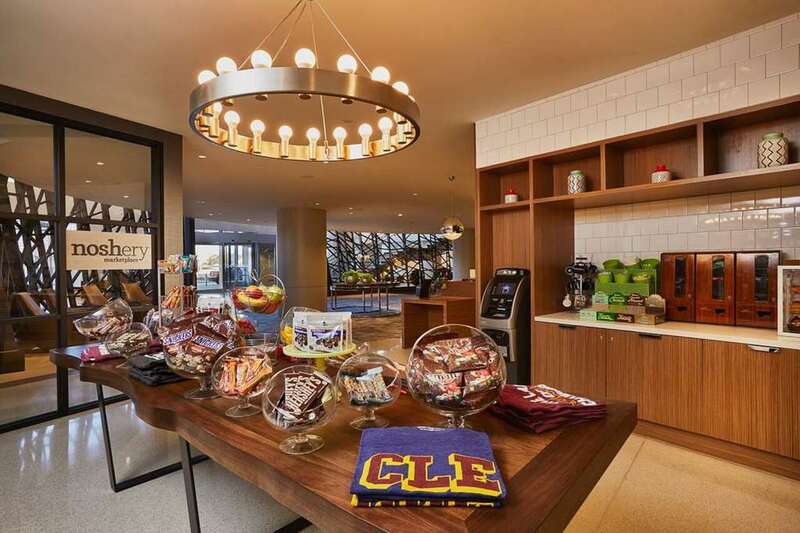 Hilton Cleveland Downtown is in the heart of Cleveland*s vibrant downtown area connected to the First Merit Convention Center of Cleveland and near attractions dining and entertainment. Enjoy a concert or game at the Quicken Loans Arena First Energy Stadium or Progressive Field. Nearby are the Rock and Roll Hall of Fame and Museum and Playhouse Square. Our downtown Cleveland hotel offers 600 beautiful functional rooms with sleek modern decor. Enjoy the exceptional views of Lake Erie and the Cleveland skyline and handy amenities such as a 50 inch to 65 inch HDTVs an iHome docking station with USB connectivity a mini-fridge safe and built-in workstation. WiFi is available for a fee. Upgrade to a suite to have a separate living area. Enjoy fine dining at the on-site restaurant and appreciate a cocktail and a great view of Lake Erie from Bar 32 on the top floor or relax with in-room dining. Noshery: Feeling peckish. Hungry but not starving. Forgot your toothbrush or a last-minute gift from Cleveland. Stop by the conveniently located lobby self-serve Noshery for Starbucks coffee and breakfast sandwiches yogurt parfaits and salads and all your on-the-go essentials.